You are missing teeth, or, about to lose teeth and your dentist did not give you any other choice than a “flipper”,”bridge”, or a denture. Your dentures wobbles around when you eat. Your denture goes too far back in your mouth and gags you. You wish you could taste the foods that you love and feel the aroma of your red wine again by drastically removing more than half of the bulk of your denture and make it fit ten fold better. You Don’t Like the Way You Look and Want a Beautiful Smile. Then, you’ll fit right into this practice because it is dedicated to helping people like you by the miracle of dental implants. Dear Friend: Welcome to the new era in dentistry! Dr. Kaushesh and Serenity dental method of implantology is unique, gathered after 1000s of hours of training from learning different systems around the world to give our clients faster, easier, predictable and longest lasting solid teeth and dentures in the mouth. Dr. Kaushesh is a leading expert in implant dentistry – he is board certified in implantology by the American Board of Oral Implantology/Implant dentistry grating him a diplomate status. The ABOI/ID Diplomate designation symbolizes the highest level of competence in implant dentistry. Certification by the ABOI/ID attests to the fact that a dentist has demonstrated knowledge, ability, and proficiency in implant dentistry through a rigorous examination process. Losing a tooth, particularly a front tooth, is a traumatic experience. It alters your ability to chew and how you feel about yourself, your confidence, your self-esteem. It can even alter your lifestyle and affect us socially and professionally.Most people are still less informed about the miracles of dental implants; in fact, there are common myths about implants that keep people from not selecting them as the premier choice to replace teeth!Common Myths about dental implants Dental tooth implants have been in use for more than 40 years! Even though they are quite common, there are three “myths” that I hear potential patients describe all the time. Myth#1: Dental implants are painful! There are three things that will predict whether this procedure will hurt. The ease or difficulty of your unique situation is first. The second factor is your ability to heal well. And third, the skill and training of your implant dentist. Pain should not be a factor in your decision making process. Choose the treatment that will give you the best result. Although I do write narcotic prescriptions such as Vicodin, most of my patients end up just using tylenol and/or advil. IV sedation is highly recommended as it will reduce post-operative pain too!At Serenity Dental of Havasu, advanced procedures are done for you to reduce pain from the get-go – such as administration of IV anti-inflammatory medicine prior to procedure, and placement of Platelet-Rich-Plasma where indicated to virtually eliminate chances of Dry Socket. Choose the right dentist with the right skills – choose Dr. Kaushesh who has placed and restored more than 1000 dental implants! Experience matters! Myth#2 Dental implants are expensive!FALSE! Single tooth dental implants do not cost much more than an average 3 tooth bridge! In our office in Havasu, the cost is almost identical. The long-term cost for having an implant versus a bridge is much lower, since a bridge will be replaced every 7 -15 years. Your dental implant will most likely never need to be replaced! If you have a bridge, your adjacent teeth will be irreversibly ground down into little nubs. This fact alone is worth it.If you have lose dentures and can’t eat – you are losing out a lot! If you are embraced about your dentures and can’t eat a meal with your loved one – you are missing out.Can you put a price tag on enjoying the things that you really love like eating what you want, when you want, with whom you want? Can you live with rest of your life with mental and physical trauma caused by ill fitting dentures? The truth is you live once, and you have important occasions once. You are unique and you deserve to live with comfort. loss of teeth bringing you down? Loss of function driving you nuts? Time to get dental implants underneath your dentures. Myth#3: Dental Implants take a long time! FALSE! Having an implant usually takes 2 – 4 months on average. A bridge takes 3 – 6 weeks. It is a short term sacrifice for a long term benefit! Bone by nature, takes a while to heal. Have you ever broken a bone and had to wear a cast? I’m sure you had to wear it for a several weeks! The bone around a newly placed implant has to mend, just like the bones in your arm would have to. A bone graft, may or may not extend the amount of time it takes for healing. In our Havasu office, you will always have an option to wear a temporary tooth! You don’t have to walk around with missing teeth during the process! Dental Implants: As good the replacement gets! The implants are placed under the gum and into the bone at a surgical appointment in the dental office with local anesthesia and usually under IV Conscious sedation. Healing times vary but typically range from 6 weeks to 6 months. Advancements in technology have made it possible where in many situations the teeth can be placed on the dental implants immediately allowing the client to leave the surgery with teeth in place. The implants are not healed of course and special precautions during healing must be followed but these new technologies cut considerable time off of treatment as compared to even just a few years ago. After healing, the final teeth are attached to the implants in various ways based on the client’s desires and dental needs. The total process generally takes from 4 weeks to nine months to complete. In very complex cases which are fortunately rare, there are only a handful of dentists like Dr. Kaushesh that can provide treatment from start to finish. These cases can take a year or more to complete. The implant is made of a biocompatible material called titanium, which cannot decay and does not need root canal therapy. One great advantage of implants is that they stimulate and preserve the jaw bone and prevent it from eroding over time causing facial changes related to tooth loss. Not only are implants a “third set of teeth” but they keep your bone structure healthy. Just like your muscles must be exercised to stay strong, your bone must be exercised by chewing pressures through the teeth or implants for the bone to stay strong and not dissolve away. If it has dissolved away, bone grafting is often required. This complicates treatment and increases cost so the sooner the implant treatment is performed after tooth loss the better off you will be. 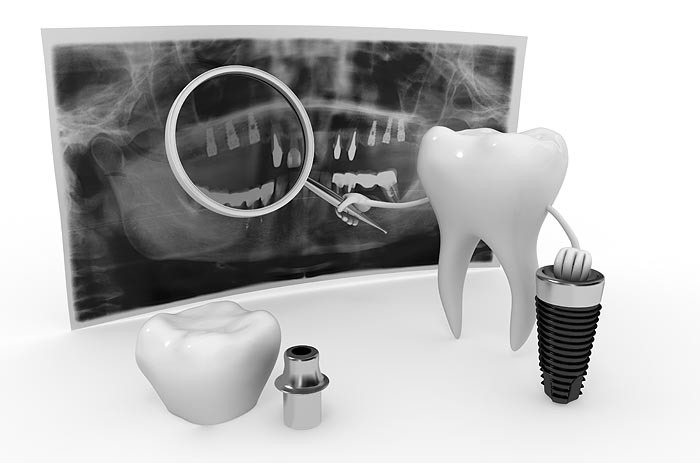 So what is a dental implant? 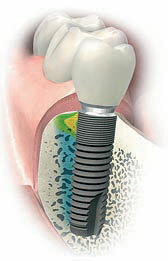 Dental implants are titanium posts that are similar in shape and act as artificial tooth roots. These are carefully placed in the jawbone and allowed to heal. During the healing, your bone grows up to the implant locking it into place. There are many brands of implants on the market. Dr. Kaushesh scientifically evaluates the research to determine the best implant choice for your long term success and only uses implants that meet these criteria using a Cone Beam CT Scan – a machine which is available right in our office. Sometimes the crown or teeth are put onto the implants at the time of surgery. Other times, this is not done until after a period of healing and then the crown or teeth are made to fit on top of the implant(s) to replace a missing tooth or teeth with a “brand-new” tooth or teeth. In some cases, you can function on your new teeth immediately and in many other cases, you can be functioning on your “new” tooth in as little as 6 weeks! They look and feel just like your own teeth. 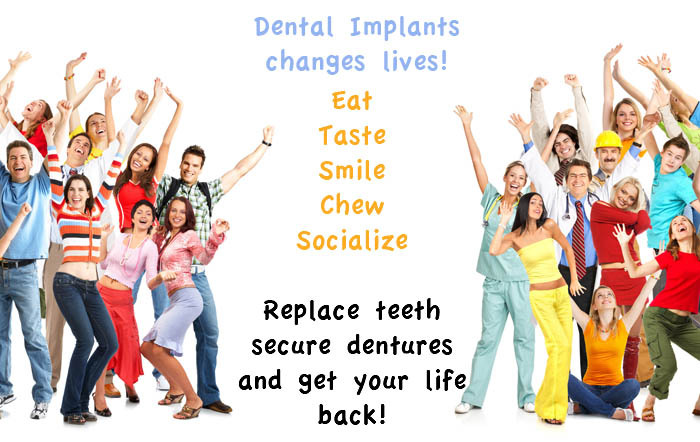 Dental implants restore your confidence to talk, laugh, and chew with comfort and without worries. You can kiss those dentures or partials a gooey adhesive goodbye. 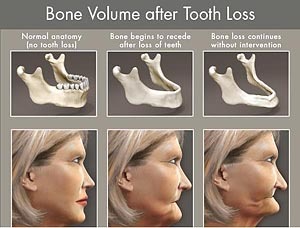 Implants preserve your facial structure. Implants prevent the face from the collapse that occurs under conventional bridges, dentures, and removable partial dentures. In clients who have lost all of their teeth, the lower one-third of the face is dramatically collapses due to these changes if implants have not been used. Implants form a strong bond to the surrounding bone to provide support and anchorage for biting and chewing as well as stimulation for the bone to hold it in place. Implant-supported crowns and bridges do not require neighboring teeth for support. When teeth are replaced using traditional tooth-supported bridges, the teeth on either side of the missing tooth are ground down so that the bridge can be cemented onto them. This (often times healthy) tooth structure can never be replaced. Removable partial dentures are even worse using destructive clasps which grab a hold of the adjacent teeth. As the partial rocks back and forth, it can loosen the teeth it depends on for anchorage, causing them to be lost. This device was a breakthrough when it was invented over a hundred years ago but now serves as nothing more than a dental extraction device for those who have unfortunately been wearing one. Implants replace the entire tooth and the missing root so it is a free-standing restoration. This leaves more of your natural teeth untouched and free of restorations which over time saves your natural teeth. The science shows that the lowest risk to you of losing another tooth is provided if an implant replaces a missing tooth versus any other dental treatment method. Get better health and nutrition because you can eat what you want. clients are either knowingly or unknowingly unable to eat certain foods, such as fruits and vegetables, which compromises their nutrition. This can be such a gradual process of things being subliminally eliminated from the diet that only after many years does a client have a “light bulb” go off and realize all of the healthy foods that have disappeared from their diet. With dental implants, it is much easier to bite into and chew your favorite foods and to eat for health. 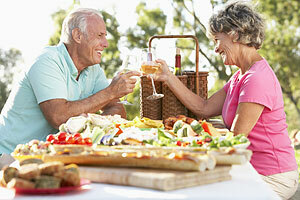 Denture wearers are usually stuck eating sugary high carbohydrate foods just because that is what they can chew. 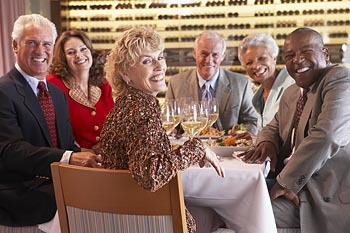 It is no wonder that denture wearers have more general body diseases that are related to these nutritional problems, consume more drugs to control these diseases, and wind up in the nursing home in higher numbers than other members of society due to the long term whole body effects of poor nutrition and increased severity of medical problems. To add injury to unnecessary insult, the care-giving staff at many of these facilities does not realize the extent of the issue and has very little empathy because of this ignorance. Finally, for many of these people, their dentures (even if they could wear them) wind up getting lost meaning that the last memories they leave their families is of a favorite grand parent missing their teeth at the end of life. An implant supported crown can be cleaned like your other natural teeth, i.e. brushing, waterpik, sonicare, flossing. Cleaning under a bridge, however, requires the use of floss threaders for proper cleaning, while a partial must be taken out several times a day and scrubbed clean. Both of the alternatives typically mean tooth decay starts again leading to more dental drilling, root canals, and tooth loss…..a never ending domino effect till all of the teeth are lost. An upper denture covers the palate and effectively divorces you from half of the taste of your food. Over time the plastic also becomes saturated with oral fluids that interfere with the taste of your food. Essentially you are sucking on an old dirty piece of plastic while you eat your food. No wonder clients complain about odd tastes! With implant supported teeth, it is not necessary to cover the roof of the mouth. This frees you to enjoy improved taste of all of your favorite foods. What if I have already lost all of my teeth and wear dentures? If you are a denture wearer and are having problems keeping your dentures in place or you cannot enjoy your favorite foods, then implants can make a life changing difference for you. Depending on your individual case, anywhere from 3 to 8 implants can be placed in each jaw to anchor new teeth in place. This greatly reduces the bulk of the teeth and can even eliminate the denture completely. No more wobbling or clicking; no more messy pastes and glues. You will be free to enjoy all of your favorite foods with confidence and comfort. A word of warning to the denture wearer: One of the things that is seldom shared with the denture client is that there will always come a day when no denture can be satisfactorily made or worn due to the deteriorated condition of the jaw. When that day comes, the only way to get teeth again is with major bone grafting taken from the top of the hip in the hospital. There are roughly a half a dozen surgeons in the U.S. that have a very high success rate with hip grafts to the jaw bone. The best surgeons in the U.S. is located at UCLA, NYU and at Loma Linda, and therefore Dr.Kaushesh recommends that his clients requiring this type of graft have the procedure performed. Upon adequate healing, Dr. Kaushesh will then place the dental implants and teeth in Lake Havasu City. It is best to avoid ever reaching this point in life by having implants placed well before the day of needing a hip graft arrives. If you are under the age of 65 and wearing a denture Dr. Kaushesh should perform an immediate implant evaluation because after the age of 65, no insurer or Medicare will cover this medically necessary surgery which then becomes an out of pocket expense for the client. This alone can cause the cost to get your teeth back to double! Published clinical research shows that implant supported restorations have been successful for over 30 years with success rates now reaching over 95%. These cases were carefully followed from the very beginning and are likely to remain successful for the lifetime of these clients. Dental implants are designed to be permanent but there are many factors that contribute to their longevity. Dr. Kaushesh plans your case based on your age at the time of treatment, family health history, and individual client needs. 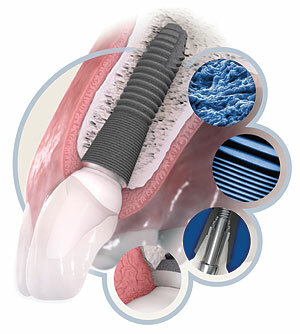 In addition, implant technology is constantly changing and improving. Dr. Kaushesh is constantly attending international meetings looking for what is going to provide the most predicable result over the course of his clients’ lifetimes. Home care and regular visits to the dentist or specialist are probably the most critical aspects of making your implants last. Dr. Kaushesh and his expert implant hygienist closely monitor the health of your implants and make personalize the types of care that ensure the long term health of your implants and new teeth. The things that can affect the long term wear on your implants and teeth are smoking, grinding/clenching of the teeth, or too much pressure on the implants. Careful follow-up and observation are also necessary to minimize these risks to the client with these issues. Research shows that the average traditional dental bridge lasts from 7-10 years and that partials and dentures last an average of 5 years. The part the research doesn’t talk about that much is that when these procedures fail they typically cause worsening dental problems and tooth loss. In what situation then, if any, would a dentist recommend a tooth supported bridge? Until recently, most dentists considered conventional bridges the treatment of choice for replacing missing or lost teeth. While a close majority no longer considers the traditional destructive bridge the ideal tooth replacement, slightly less than half of the profession (tens of thousands of dentists) still do not give implant options as part of their treatment plans. Dr. Kaushesh recommends that you seek a second opinion immediately if dental implants were not discussed as part of your care before proceeding to bridges, dentures, or partial dentures. More Advantages of Dental Implants! 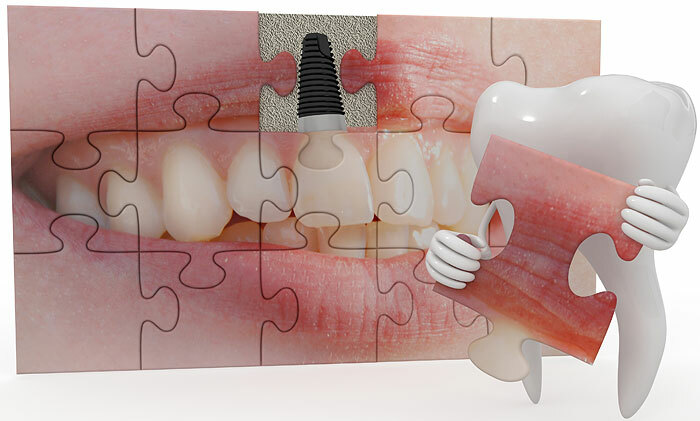 Dental implants allow the replacement of missing teeth without destructive grinding on healthy teeth to make bridges. Traditional dental procedures are still indicated today. However, with dental implants, some of those procedures are outdated and contraindicated. Dental professionals advocate the preservation of natural teeth and tooth structure. Dental implants fit into this concept since the need for the removal of healthy tooth structure (enamel) has been eliminated by his method. Dentists all agree that a tooth begins a downward spiral after being touched by a dental drill for the first time. Dr. Kaushesh has been using implants and helping raise the “standard of care” for tooth replacement for over six years. Partial dentures (RPD) have been used to replace missing teeth for over a hundred years. Just by looking at that one phrase, you can immediately understand why it is an outdated treatment option because it must be ‘removed’ by the client several times per day to clean, ‘partial’ because it is a scaled down version of a denture that replaces fewer teeth, and dental-medical technology has progressed substantially from where it started a hundred years ago. If it is used long enough, many clients wearing a “partial” denture can look forward to graduating from their “partial” to a “complete” denture due to the disastrous side effects of the partial on the remaining natural teeth. Dental implants feel so natural and look so good, you just may forget you ever lost a tooth!